Tommy John surgery can be a scary proposition especially for young players going under the knife. Luckily, the Twins have seen players successfully return from surgery and have a major impact at the big league level. One needs to look no further than Miguel Sano to find a Twins position player who was able to rehab and return with a vengeance. Minnesota’s top pick from the 2016 MLB Draft will be looking to follow a similar path. Alex Kirilloff has multiple hoops to jump through but Tommy John surgery might have allowed him to become an even better player. That being said, he has a lot to prove in his age-20 season. Kirilloff’s bat and approach at the plate have always been his ticket to the big leagues. During his professional debut, the Twins had him skip the GCL and head straight to the Appalachian League. Across 216 at-bats, he hit .306/.341/.454 with 17 extra-base hits and a 32 to 11 strikeout to walk ratio. He was able to put up these kind of numbers while being 2.5 years younger than the competition in the Appy League. In fact, he never faced a pitcher younger than himself in over 230 plate appearances. On the defensive side of the ball, Kirilloff has shown the ability to play all three outfield positions. The majority of his time was spent in right field as he projects as a corner outfielder at the big league level. In just over 400 professional innings, he has seven outfield assists. Overall, he has the tools and athleticism to handle either corner outfield position. 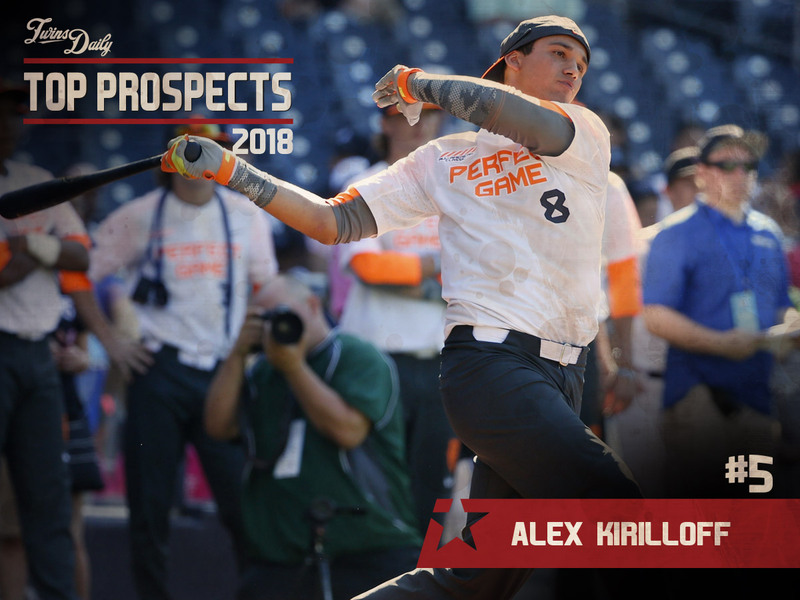 Kirilloff’s has been praised for his high baseball IQ and his strong work ethic. His father instructs youth on hitting so Kirilloff has been raised around the game of baseball. Being off the field for over a year might have been a good thing for Kirilloff as there are rumors of him adding 25-30 pounds since he last suited up. For players drafted out of high school, there are always questions about how they will grow into their bodies. When the Twins drafted Kirilloff, he was already 6’2” and 195 pounds. Seth recently had Kiriloff on his podcast and he asked him about the rumors that he’s added 30 pounds of weight. For a player that hasn’t seen game action in quite some time, there will likely be some rust to shake off during spring training. More power should come if he has added 15-20 pounds. Like he told Seth, he feels stronger now and that could be dangerous for pitchers in the Midwest League. He should start the year at Cedar Rapids, unless there is some rust to work off and then he could stay in extended spring training. He could end up in the same line-up as last year’s top pick Royce Lewis. Minnesota doesn’t have any plans to move Kirilloff faster because of his missed time in 2017. It sounds like he may be in extended spring training for a couple weeks based on those quotes. Whatever sets him up for the most success is what I want, but for selfish reasons, it would be nice to watch him in Cedar Rapids. If I lived in the Twin Cities, I think I would be planning a May or June trip to Cedar Rapids to see Kirilloff and Lewis in action before they get pushed up to Fort Meyers. Curious: How did Kirilloff hurt his TJ ligament? Were his throwing mechanics incorrect, or did he simply overdo it with hard throws? I like him a lot. It's nice to have a OF slugger in our system again. Arcia didn't quite make it and I think he was last true OF slugger we had in our system. Looks like Kiriloff might project to do a bit more offensively than Arcia. I think both the fangraphs guys and Mayo in his recent questions answered have mentioned Kiriloff as a guy who could jump up the lists next year. Fangraphs actually had Kiriloff in their top-100 (at #99). I am the skeptic - as usual.Until he proves himself he is not a top ten prospect let alone #5 for me.I can only judge a player from time on the field and he has not had enough time to convince me that he should be at this level.All we have is the fact we drafted him #1, he had a great first year and then he blew out his shoulder.Rehabilitation is difficult and different for every person.I know as I am trying to recover from my knee replacement.I would love to see him be a star, but let him come back and earn his place back on this list. Fair enough- what do you think constitutes "proving himself" for a prospect?Two full seasons somewhere?A year at AA or above?I'm never quite sure where that line is for myself and it's interesting to hear what others use.The age-old potential vs. track record debate, I suppose.Anyway, just wondering what your personal stance is on that. Good question.He might prove himself in the first month by showing the agility that brought him to us in the first place.I am not concerned with the stats as much as the ability to show that he has not lost something during rehab.Until they get on the field they are suspect.Just like the listings of prospects that include newly acquired players who have not shown the mental adjustments combined with physical attributes.It is not a long time process and it is not stat driven so in a sense there is no real guideline, I just have my own mental system of processing.In the same way, I am fine with fast forwarding prospects, letting them get in above their head and see how they handle the challenges - I loved the aggressive promotions of players like Griffey and even Willie Mays who only got 35 games as a Miller before jumping to the majors. I hope that Kiriloff makes me look bad.If I were making the prospect list which is beyond my ability I would not have anyone in the top ten that was not in the field the previous year.I would make a note that if they come back with the same ability they would be ranked??? I can see the objection to ranking him this high coming off a significant injury that cost him an entire year of development time. but his debut was pretty terrific and TJ has never been as scary a prospect for position players as it is for pitcher. I might have downgraded him a little on the list for it, but not much. There's something delightful about him playing with Royce Lewis this season, and if they move on a similar track through the system it could be a huge boost for the Twins. Getting two players with all-star ability arriving around the same time really has an enormous impact. I think he's going to hit. A lot. Looks like he could end up with a plus arm and already seems to be doing well in his decision-making. If he keeps a decent range now that he's adding muscle, he'll be a nice addition in the corner OF spots. Patience will be key...esp coming off TJ surgery.But this kid has all the physical makings of a stud.Has that prototypical LH power swing. Thanks- I'd characterize that as however long it takes to show he's back to pre-injury form.That makes sense to me. "Ladies and gentlemen, prospect hopefuls and fans alike.To ground your upbeat and enthusiastic portrayal of a Minnesota Twins prospect with exponential, sky's the limit power potential.May we present to you, Exhibit A, Oswaldo Arcia.Batted .375/14 HRs/58 RBI in 250+ at bats for the Elizabethton Twins in 2010." However, I'm a rube and love this kid's smooth swing.He's shown pretty good plate discipline in his pro debut.I'd love for him to put some balls across Rockford Rd this summer. One difference is that Kiriloff's baseball IQ is cited (as is the case for several Twins prospects). Arcia's baseball IQ seemed to extend no further than knowing to grip the bat by the skinny end. Skills are important, of course, but understanding the game and knowing the right play is better than just playing. It could shorten the experience curve needed to move up. I remember when he was drafted that some scouts were worried he had a long swing, or slow bat speed, which would limit his upside. Their take on his extremely well-coached approach was that he might already be maxing out his upside and have little room for improvement. I haven't heard any discussion about this since. Has anyone heard anything since then about whether his bat is quick enough to hit major league pitching? "Ladies and gentlemen, prospect hopefuls and fans alike. To ground your upbeat and enthusiastic portrayal of a Minnesota Twins prospect with exponential, sky's the limit power potential. May we present to you, Exhibit A, Oswaldo Arcia. Batted .375/14 HRs/58 RBI in 250+ at bats for the Elizabethton Twins in 2010." However, I'm a rube and love this kid's smooth swing. He's shown pretty good plate discipline in his pro debut. I'd love for him to put some balls across Rockford Rd this summer. Is Kiriloff comparable to Jason Kubel? Not sure. It's certainly not an insult. Remember, before he tore up his knee, Kubel was an elite prospect. The Twins were going to let Jones go to start Kubel before the AFL accident. Prospect wise, Kubel was a 12th round pick that kind of blew up on the rankings at age 22 when he went from AA to the majors. Kubel had pretty good k/bb numbers although his power came and went before that. He was probably a touch overlooked (12th round picks tend to be) but he might have been listed as a "sleeper" or so. Kiriloff is ahead of him on pedigree but a healthy Kubel like outcome isn't too far off, I'd think. Both can probably hit for average and power with decent on-base ability. Kiriloff is probably a better athlete and faster. (I think a better comp might be Cuddyer even if he was a right handed hitter). I also have reservations ranking him this high simply due to missing a year and shaking off rust after one half season of pro ball, despite his production there and draft status. But I get it, we're talking about potential and prospects. Also hard to drop them from something out of their control. I have to say, there have been various comments about certain player rankings when they are so young, so raw, and at lower levels. All prospects are just that. There are no guarantees, and we should all know that and remember that. But I am so excited for the amount of this raw talent at A+ and lower. I feel OK we're a little short at the high level, except for pitching, because we've graduated so much talent the past couple of years, position wise. One honest concern I have...and the 2018 season may just take care of this once complete...is Just how much young talent may have to be protected on the 40 man next off season. I'd agree in saying it's definitely not an insult.Kubel crushed the minors.Weird he spent 2 seasons in the GCL and then skipped over Elizabethton and all that Dr. Enuf.Kirilloff does seem very polished at his young age.He does fit the build of Cuddyer a bit more.Cuddyer actually went straight to A ball out of high school and hit in the .270's. I'd expect Kirilloff to be a very steady bat.I'd have Morneau shadow him in the cage throughout ST. I would say there there are a lot of prospect similarities. Remember when Kubel was coming up, people said he could hit for average like Mauer and hit for power like Morneau.. and I think Kirilloff can hit for average and he's strong so he could hit for power too. If I remember correctly it was his non-throwing arm that he hurt. It was his throwing arm. Ahh... I stand corrected. Thank you.